Leevi Madetoja was a hard-working composer-conductor-teacher-critic (...). His three symphonies are talented, unpretentious examples of the post-Romantic line (...) unfailingly well-crafted and grateful on the ear (...). Striking and memorable is the four-movement Okon Fuoko Suite (...). The music is ear-catching in its sonorities and far from obvious in its rhythmic and harmonic language - sufficiently so as to prompt regrets that the hard-pressed composer did not live to realise his plans for a fourth symphony or a Finnish 'Parsifal'. 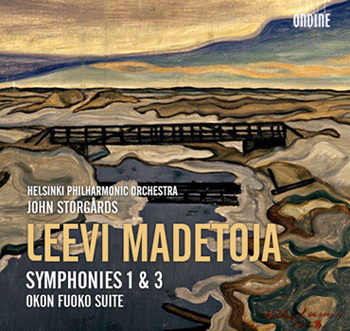 This new release completes Ondine's recording cycle of Leevi Madetoja's (1887-1947) symphonies. The disc features his Symphonies Nos. 1 and 3, and an orchestral suite drawn from the Asian influenced ballet pantomime Okon Fuoko. Leevi Madetoja, a contemporary of Jean Sibelius, found a voice for himself where the elegiac nature of the landscape and folk songs of his native province of Ostrobothnia merged with a French elegance. Madetoja's First Symphony, premiered in 1916, reflects influences from Tchaikovsky and Sibelius but is a remarkably original achievement for a first venture into the genre. Madetoja's Third Symphony found its genesis in France, where the composer travelled with his wife in spring 1925. In comparison to the first two symphonies, it has been considered more restrained and subtle, but also more nuanced, richer in content and more ambiguous in expression. Madetoja reveals a surprisingly modern aspect of himself as a composer in his orchestral suite from the ballet pantomime Okon Fuoko. The work, with clear affinities to Ravel and Prokofiev, demonstrate that new international trends in the 1920s did not pass Madetoja without leaving traces. John Storgårds, one of Finland's exceptional artists, has taken the classical music world by storm in recent decades. Since 2008, Storgårds has been Chief Conductor of the Helsinki Philharmonic Orchestra and Principal Guest Conductor of BBC Philharmonic Orchestra since 2012. The latest release of works by Rautavaara (ODE 1178-2), featuring Truls Mørk, Collin Currie, the Helsinki Philharmonic Orchestra and John Storgårds, received a Gramophone Award in 2012. This recording completes Ondine's cycle of all the three symphonies by Madetoja with the Helsinki Philharmonic Orchestra under the baton of John Storgårds. The first release, containing the recording of Symphony No. 2, was released in January 2013.